Curved sided slipware bowl with folded strap handle. Light monochrome glaze with unglazed foot ring. Eric Cornwell Lowe was born in Melbourne in 1901 at East Brunswick, Victoria. At the time, a number of potteries operated in the area, but Eric’s father (Arthur Horace Lindsay Lowe, 1868-1938) was a Salesman and later an Agent. His mother was Amy Beatrice Catterall (b1871). Eric moved to Sydney and married Vera Louisa Christopher in 1932, they do not appear to have had children. Arthur and Amy moved up in the world, moving from Brunswick to Moonee Ponds, then to Caulfield, an affluent Melbourne suburb. Young Eric was quite entrepreneurial in his late teens as he began importing cut glass and crockery from Germany and Czechoslovakia. Timing was not on his side as this began in 1939. 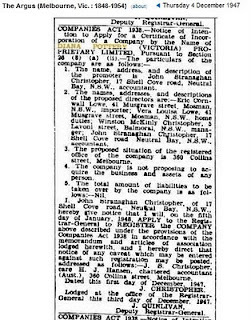 This company was called “Eric C Lowe Pty Ltd.” “Manufacturers of Utility and Fancy Earthenware”. 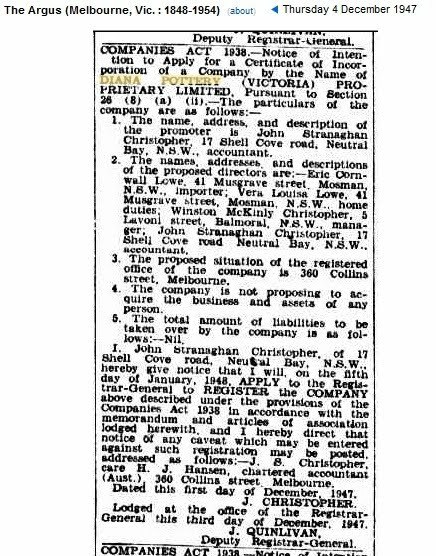 The business was incorporated in New South Wales on the 11th of July 1939, having previously been carried on by Eric as a sole trader, and was given 401 ordinary and 2665 preference shares when incorporated. Eric had a large amount of stock on hand and could not sell it due to the stigma now attached to German goods. So, during the Second World War (1941) Eric and Vera got Government contracts to produce ceramic wares (cream ware cups and mugs and pots and jugs) for the armed forces. Eric did not join up as many of his contemporaries did. Many industries supplying the armed forces were “protected industries” and many of their employees were exempt from military service. Most potteries at that time were geared for the war effort and the demand from Australian and American troops was enormous. Seen after the company incorporated, in 1941, Eric began making art pottery. This did not last long as wartime restrictions meant that this was prohibited in May 1942. They began making teapots, jugs, cups and mugs around May 1942. During wartime, price control measures meant that Eric had to submit financial returns to the Commonwealth government. This fixed the price that Eric could charge for the output. Thankfully, these records still exist. These give detailed accounts of all the itemised accounting for the business. These are notable for showing that Fowler, Bakewell and Mashman were making similar items for the services. Still, this did not stop the business from making a profit of 39.3% in 1940/41 and 26.0% in 1941/42. Profits gradually dropped and the next year they only made about 13%. In 1943/44, the profit was down to 10.7%. The next year produced a deficit of £411. Late in 1944, Eric had to repay 25 of his workers back pay because of a Womens Employment Board decision that he had underpaid them. These were all women as most men had by then enlisted. 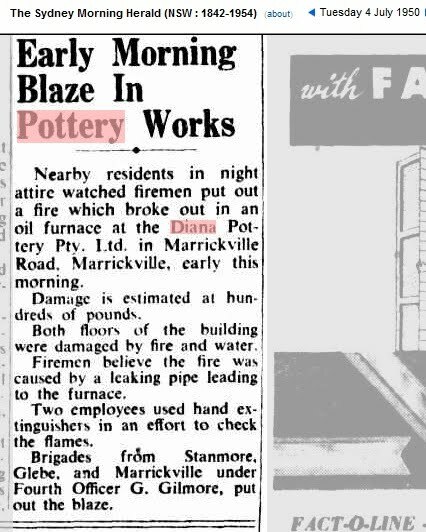 Although born in Victoria, his pottery was started at 122-126 Marrickville Road, Marrickville, Sydney and it continued there until the early 1970s, when cheap copies and imports caused a drastic decline in sales and its eventual closure. The giant Fowler works were already established there works in the area because of the clay found in the area, and later, Studio Anna commenced nearby. They also purchased kaolin from the Pottery Clay Works for £3.15/- per ton. Their output included such products as ceramic horse-head book ends, several other animal figures, (a pair of greyhounds was a popular product) tableware, utility and kitchenware. Over 200 different shapes were produced during their lifetime. Some products were sold using the name “Hollywood.” By the early 1950s the company had more than 70 employees and were producing a large range of hand painted articles which included "Waltzing Matilda" musical mugs and jugs, and produced bright "gumnut" pots with pale green and brown glazes. The musical mugs and jugs played when lifted, but the movements were expensive and difficult to obtain, being imported from Switzerland, so many mugs and jugs that should have had movements were sold without at reduced prices. In the 1960s Diana diversified their range further into decorated oven and kitchenware, hand painted with maple, poinsettia, cornflower, blackberry, wattle and flannel flower designs. In the 1960's, a variety of small slip cast vases hand decorated in gold were made for a gift shop in the Imperial Arcade Sydney which were marketed under the name 'Imperial'. Although these are not ramekins, I have some of them. After the Second World War there had been a massive increase in the number of potteries around Australia. Commercial, studio and backyard potteries were being established in the suburbs of most major cities and by 1955 there were over 12,000 people working in the quarrying and manufacture of clay related industries. This also included brickworks. After the war, Eric had changed production to domestic pottery and throughout the 1950s, Diana was the largest and most prolific pottery in New South Wales, producing hundreds of different products and designs, many hand painted. Native wildflowers were a popular motif. Among them, as mentioned, the Flannel Flower, an iconic Sydney plant used in imagery and art since colonial times. Sometimes known as the Sydney Flannel Flower, it is usually known as the Flannel Flower and was chosen to be the New South Wales floral emblem for the Centenary of Federation (1901-2001). It is found in the sandstone national parks in the greater Sydney area and can be sometimes found in spectacular drifts. The flowers are about 50mm in diameter and appear in Spring. The stunning Pink Flannel Flower is rarely seen as it only appears in the summer following a bushfire. Soon after the end of the Second World War, Eric began advertising for more staff and soon had a thriving business making home-wares for the thousands of ex-servicemen starting their families. His pottery even had a staff canteen, far more advanced than many of the other one or two person companies operating on a shoestring budget. 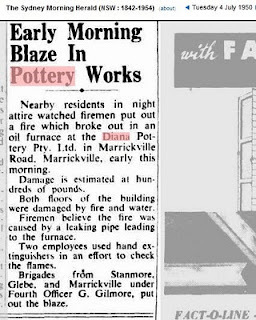 In the mid 1960s, they (Diana Pottery (Vic) Pty Ltd) had a shop in Melbourne at 343 Little Collins Street. The potteries around Australia employed thousands of people, many given their start in Australia following migration from Europe after the second word war. Eric Jungvirt who started Studio Anna was one who started with Eric at Diana. I think it fair to say that you would have had a piece of Diana pottery in yours or your parents home at some stage, probably a ramekin, a mixing bowl or a vase. At their peak, Diana employed around 70 people but this had declined to around 30 by 1970. They continued on for a few more years calling their output “Dana”. In Australia, the Whitlam Government had cut tariffs without warning by 25 percent in 1973. 1974 saw an increase in imports of 30 percent. By mid-1974, Australia was in an economic slump with unemployment rising significantly. Short-term credit rates rose to extremely high levels and this caused prices to spike sharply, and according to Government figures, inflation topped 13 percent for over a year between 1973 and 1974. On top of these problems, wage parity was legislated for female workers meant an increase in wages costs.It was in this climate that Diana fell on hard times and ceased production. Eric was by then in his early 50s. Much of the Dana ceramics were copies of the later “Nefertiti” ramekins, with a rough textured (Avocado) exterior and a brown glazed lip and interior. They also produced wares using the names Hollywood, Imperial and just plain Australian. Check out the Diana website for lots more. Also, a potter at Bendigo Pottery told me that the conveyor that moves the pottery around the Bendigo Pottery today was said to have come from the old Diana Pottery after it closed in 1974. The entire Marrickville site consisting of the Fowler, Diana and Studio Anna potteries was demolished and subdivided in 1982. Eric died in Sydney NSW on the 10th February 1977 age 76. Vera lived on for many years. Hi, congratulations on a wonderful and extensive collection. I'm particuarly interested in Diana ware, and just have begun a small collection, but no ramekins, yet:) In addition, I'm doing some historical research on the brothers Ian and Eric Lowe, and their respective pottery businesses. 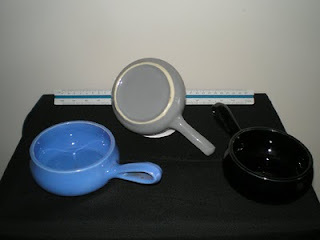 You mention that Diana pottery had a shop at 343 Little Collins St, Melbourne. Are you able to shed any more light on this shop? In terms of any references you may have to the shop? Like book or newspaper advertisements or any other references? The only reference to the shop is in the Sands and Macdougall directory. How long it operated, I do not know. I would be interested in anything you find out about the Lowes, there is not that much around.